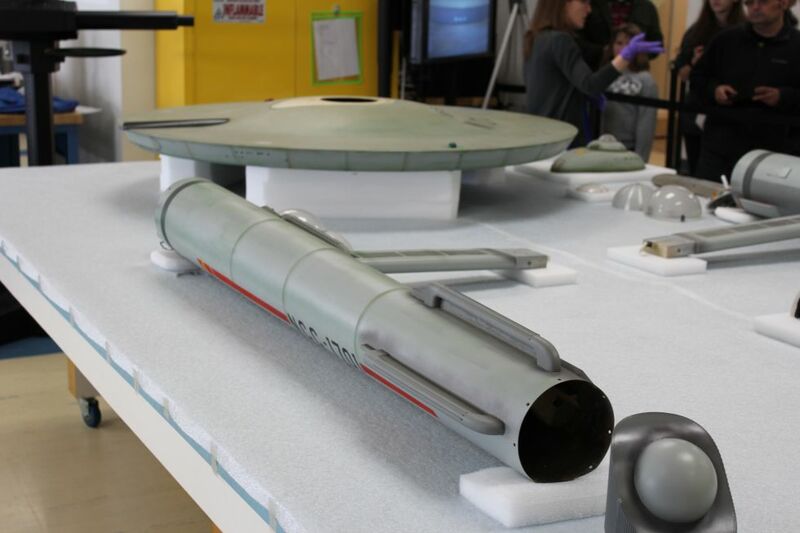 Smithsonian: The Enterprise model has been carefully separated into its individual components—saucer section; secondary hull; port and starboard nacelles and pylons; deflector dish array; hangar bay doors; and the bridge. Each section is being meticulously studied to determine its construction and condition and will be documented with visible, ultraviolet, and infrared photography. Original photographs and negatives of the Enterprise model. The dome and bridge of the Enterprise model. 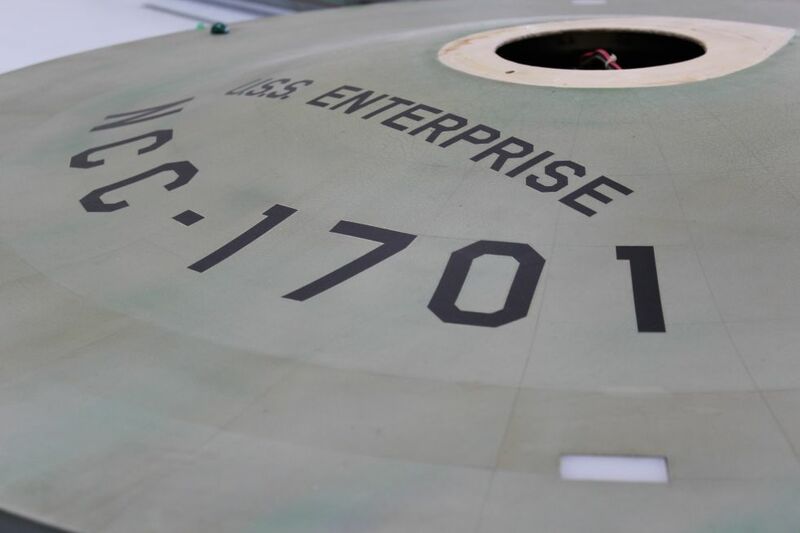 The original colour of the Enterprise is revealed. Blinking Christmas lights and a spinning fan mechanism. A cross section of paint layers. 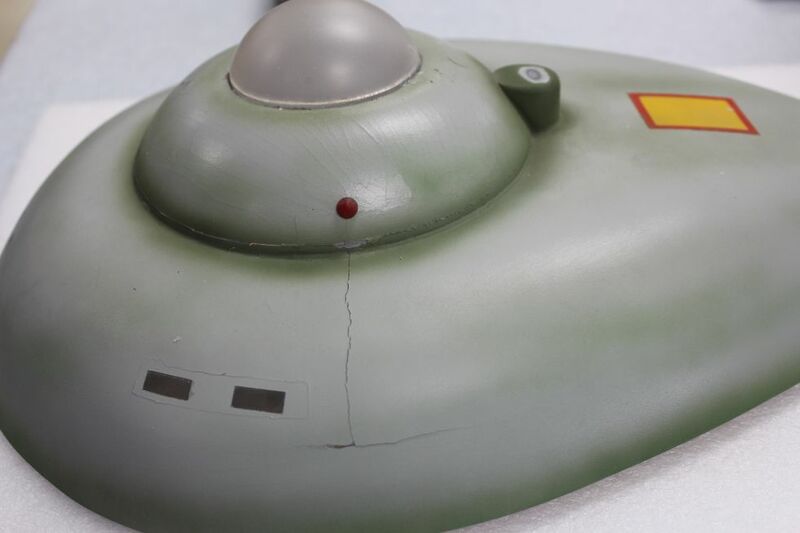 Inside the saucer of the model. TrekCore: We’ve just gotten back from our catch-up session with the Enterprise model conservation team at the Smithsonian National Air & Space Museum facility in Virginia! 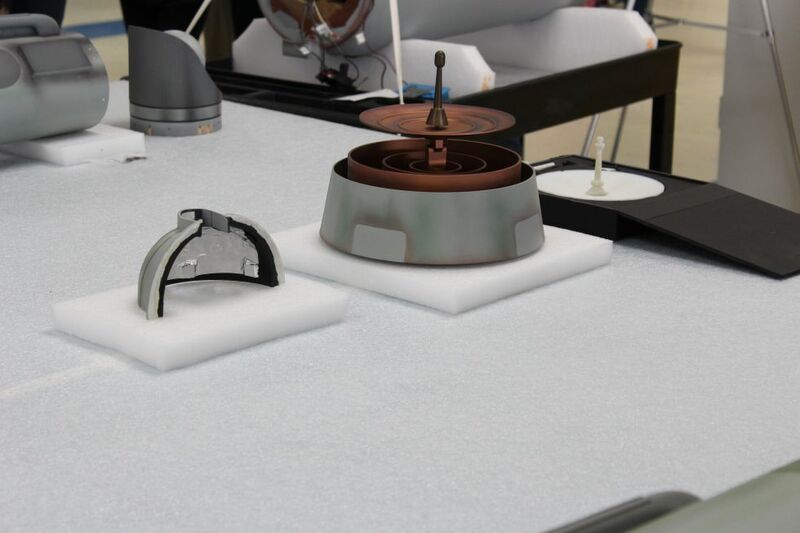 Here’s a discussion with conservator Malcolm Collum about a NEW deflector dish for the Enterprise! [Smithsonian conservator Ariel] O’Connor knows her Star Trek well. She grew up on The Next Generation before finally delving into the original series at the dawn of this project one year ago. Now she seems to know it even better than the back of her hand. There were two models of the ship built around 1964 as Gene Roddenberry began work on the first abortive pilot, “The Cage.” There was a three-foot mock-up to finalize the design, then there was this 11-foot version, the one that appears in every episode of Star Trek from 1966 to 1969. The three-foot version is lost to the sands of time, missing for decades. “It was on Gene Roddenberry’s desk for a while, and the story was that he lent it to someone and he didn’t know who or where it went,” she says. I also love that O’Connor calls the weathering details on the model “space algae”. The weathering is over done. When the orginal model was delivered it had subtle panel lines. I Just bought a 6ft kit of this ship and will only be pre shading with dark grey, careful pencil streaks, no green..sorry. To me it looks like its been at the bottom of a pond for a few weeks. The photographs on this post are from the previous ‘restoration’ that definitely had exaggerated weathering. If you check this blog (or other sources) for the finished recent restoration, it looks a lot nicer. And probably the closest we will ever get to the original.